East Hidd Housing ... work in progress. Nass Contracting has firmly established itself as a foremost civil engineering company in Bahrain with a legacy that dates back over five decades. Since its establishment in 1963, the firm has successfully undertaken projects in virtually every sector of the economy, playing a key role in the overall growth and development of country’s commercial and industrial infrastructure. Its current projects comprise some of the largest developments under way in Bahrain and address the some of the kingdom’s priorities, namely housing and infrastructure. 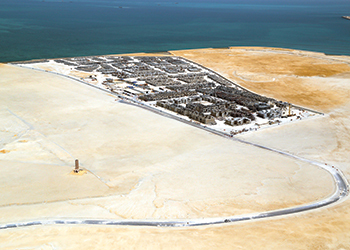 These include the construction of 487 villas in East Hidd, Dragon City in Diyar Al Muharraq off Muharraq island, and Sheikh Khalifa Bin Salman Highway, Phase Five, all of which are due for completion this year. Under a BD18.73-million ($49.679 million) contract from the Ministry of Housing, Nass – in joint venture with Kuwait’s Kharafi – has been assigned to undertake the construction and maintenance of 487 villas of various types in Zone One of the East Hidd Housing Development. “The East Hidd Housing Development is a new urban town on reclaimed land off the east coast of the country opposite the existing town of Hidd. The development is split into nine zones comprising 4,070 villas and 500 gifted plots,” David Anthony, general manager of Nass Contracting, tells Gulf Construction. The joint venture’s scope covers a 79,000-sq-m site involving a development area of 67,000 sq m. Work on the project started in July 2014 and is expected to be complete in November. The Al Matouck Consultants-Gulf House Engineering JV (AMGHE) is the assigned engineering firm. Anthony says work on the fast-track project is proceeding at a rapid pace with all of the substructure and 80 per cent of the superstructure works completed. Finishing works are under way and progressing well, he adds. Among the challenges of the project, says Anthony, are the fast-track nature of the development, which has made securing subcontractors to meet the schedule difficult as also procuring building materials – especially blocks – given the fact that manufacturers are dependent on aggregates imported from the UAE. This apart, the project is labour-intensive, with more than 2,000 workers on site. Sheikh Khalifa bin Salman Highway, Phase Five ... by Nass. 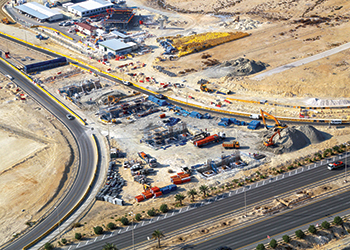 Nass Contracting’s work on the Sheikh Khalifa bin Salman Highway, Phase Five (Hamad Town), comprises Interchange Two and a link between roundabouts 18.1 and 13. Parson Global Services is the consultant on the Ministry of Works project. The company is undertaking the BD7.47-million ($19.8 million) project in joint venture with Al Yamama Contracting of Saudi Arabia. Funded by the Saudi Fund for Development (SFD), the contract for the grade-separated interchange comprises construction of a dual carriageway for north- and southbound traffic. The north-bound carriageway will carry traffic from Sheikh Hamad Avenue (leading to roundabout 18 in Hamad Town) to Sheikh Khalifa bin Salman Highway (SKBSH) in the north direction, while the south-bound carriageway (with a trumpet configuration) will provide motorists access to Hamad Town via Sheikh Hamad Avenue in the west direction. The overall width of the main bridge is 24.2 m, with each carriageway having two 3.75-m-wide lanes and a 1.1-m-wide left shoulder and 2.4-m-wide right shoulder. The ramps are of MSE (mechanically stabilised earth) wall construction. Overall, the project is on schedule, says Anthony. “The bridgework substructure is 100 per cent complete; while the superstructure is 60 per cent complete. The MSE wall ramp is 80 per cent complete on the east side and around 10 per cent complete on the west side. The at-grade roads are 75 per cent complete, while the 1,500-m link road from roundabout 18.1 to 13 is around 85 per cent complete,” he elaborates. Work on the project started in September 2014 and is scheduled for completion in December this year. Dragon City ... on track for September completion. Nass is close to completing work on Dragon City, which is on track for its September 2015 deadline. 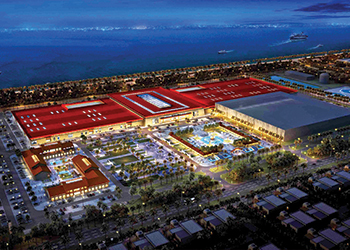 The scope of work under its BD16-million ($42.42 million) contract consists of constructing a 55,000-sq-m Chinese-themed mall including a 5,000-sq-m dining street and approximately 50,000 sq m of external works. When completed, Dragon City – which is situated on the western side of the Diyar Al Muharraq reclaimed land – will consist of approximately 750 individual shops as well as food courts, restaurants and coffee shops. “To date, we have completed 1.6 million LTI (lost-time incident)-free man-hours on the project,” says Anthony. According to him, the project’s main challenges lie in the management of the PEB (pre-engineered building) design and manufacturing process in order to ensure delivery on time to site; the sheer volume of work and sourcing sufficient labour (more than 1,000 workers on site); the pressure on procurement of long-lead items; and receiving permanent power in order to test and commission. Apart from these projects, Nass Contracting’s other ongoing projects include Diyar Al Muharraq, Durrat Al Bahrain infrastructure Phase Three, Diyar Homes infrastructure and sales centre, Asry Dolphin, and Al Ekker Mosque. Nass Contracting has in the past risen to the challenge of numerous projects including the Khalifa Bin Salman Port and Industrial Area in Hidd, the Bahrain World Trade Centre, Arcapita Bank headquarters and the King Hamad University Hospital. Among the most challenging of these, according to Anthony, was the Khalifa Bin Salman Port and Industrial Area in Hidd – undertaken between January 2002 and March 2005. The project comprised planning, design and construction of Phase One of a new deepwater port together with around 700 hectares of reclamation to provide a corridor for the port access roadway and an area for industrial development. Nass tackled the challenges on this prestigious development by making use of the expertise of the group companies for various aspects of the project, right from diving services to mechanical fabrication and supply of oil and lubricants, geotextiles, personnel protective equipment. The project called for 24 million cu m of dredged fill; 12 km of revetment protection and breakwater comprising 1.3 million cu m of quarry run bund core, and 650,000 cu m of secondary armour, filter stone toe berm; 450,000 cu m of primary armour; and vessel berthing facilities comprising 1,800 linear m of gravity block quay wall with a minimum 15 m depth designed for containers, general cargo, dry bulk and roll-on roll-off traffic small craft berths. Anthony says Nass Contracting will continue to service the development of the kingdom by providing quality work in a safe and timely fashion. The company’s initiatives include training its workforce to meet the international standards of safety practice at work; and sourcing alternative materials and methods of construction for building sustainable projects. One such alternative method was utilised in the installation of the US Navy Flyover Bridge in January 2014, a project undertaken in joint venture with Contrack. Its approach included ‘build, lift, move and install’, and is unlike any bridge installation undertaken in the Middle East,” says Anthony. The entire bridge was constructed at an offsite facility, 250 m away from the permanent location across Prince Khalifa Bin Salman Highway and was moved to be placed at two end piers with the highway completely open. “This will remain a landmark design-build project in the history of bridge construction in the Middle East, and we are proud to have lent our experience with accelerated bridge construction techniques to help set a new standard of efficiency for transportation projects in Bahrain. In future, conventional bridge construction methods could be replaced with the SPMT (self-propelled modular transporters) technology to reduce traffic interruptions from months to few hours on bridge construction projects,” he adds. Nass Contracting has a proven track record of expertise in the building and civil engineering industry specialising in industrial civil engineering, roads, bridges, infrastructure, marine/offshore construction, and buildings offering turnkey construction solutions for its clientele. The company’s long history of participating in joint ventures and as consortium partners with major international contracting companies, has strengthened its capability to undertake high-value turnkey projects like the Bahrain World Trade Centre, Khalifa Bin Salman Hidd Port, US Navy projects, and packages for Durrat Al Bahrain development. Anthony says its strength lies in its commitment to build long-term relationships with clients and partners based on integrity, performance, safety and value. And, with support from holding companies – Nass Corporation and Nass The Group, all divisions of Nass complement the other in offering complete construction solutions under one umbrella. Nass Contracting is an ISO 9001:2008, ISO 14001:2004 and Oshas 18001:2007-certified company, and the only contractor approved as a training provider in Bahrain for the ECITB International Health and Safety Passport courses. It is a category AA contractor for sewerage and drainage works, construction projects and building maintenance, and a category A contract for dredging and reclamation works, road works (civil), infrastructure and housing projects. He says the company remains confident there will be a substantial growth due to the turnaround of the market open mostly for government projects. “The current hold back in oil prices would affect construction sector and only major industrial expansions are likely to happen,” he comments. The Nass Group has extended its horizons beyond Bahrain and has set up affiliates in Kuwait (Al Ghanim Nass General Trading and Contracting Company), Saudi Arabia (Abdulla Ahmed Nass and Partners), Qatar (Qatar Al Attiyah International Group and Nass The Group), Abu Dhabi (Nass The Group) and Oman (Nass Group). Nass Contracting is keen to launch its operations in other potential markets in the Gulf. Meanwhile, its UAE subsidiary, Nass Contracting Abu Dhabi, recently achieved classification in Abu Dhabi under the civil and building class, and seaports and harbour special category, opening the door to complete the prequalification process with all the potential clients in the UAE. Anthony stresses on the company’s tenacity in difficult times. “Since 2008 we have experienced a number of downturns, starting with the economic recession and then followed by the uprisings in Bahrain. Despite the less-than-ideal economic and business backdrop, Nass Contracting has remained steadfast and maintained positive earnings by having an average turnover for the past few years,” he points out. “Regardless of the obstacles, Nass Contracting maintained its track record of achieving profitability. This further highlights the company’s strong reputation for consistent delivery, quality and safety. We will persevere, and continue to work towards maximising shareholder value in 2015 and beyond,” he concludes. The company employs 3,000 people and has an annual turnover of $300 million.